Noah Bressner/Editor-in-Chief The men’s basketball team became the first team to miss the America East Tournament under the new format. 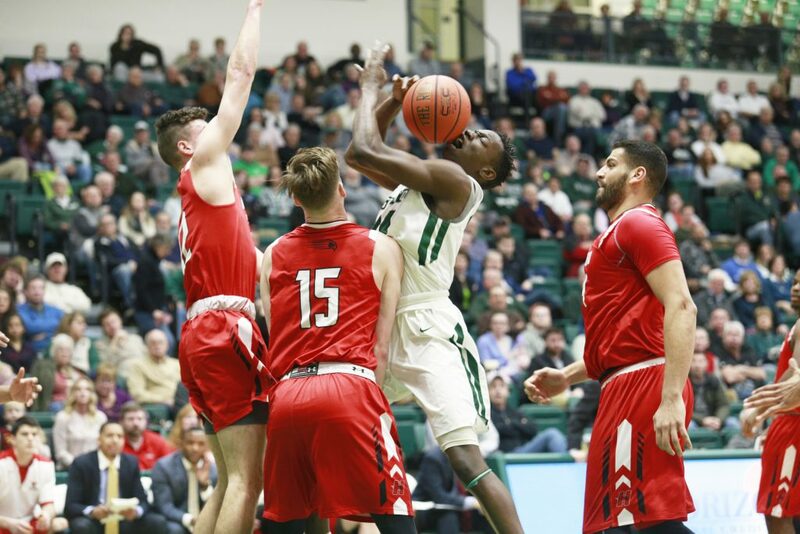 In each of its past five seasons, the Binghamton men’s basketball team has been eliminated in the first round of the America East (AE) Tournament. This year, the Bearcats (11-19, 2-13 AE) didn’t even make it that far. BU was eliminated from AE playoff contention on Saturday after a 67-57 loss to Hartford. It will be the only one of nine teams to miss the conference tournament. Binghamton has lingered near the bottom of the conference all season, shining only in home victories against Albany and Stony Brook. It has been a rocky six years for Binghamton since head coach Tommy Dempsey took over the program before the 2012-13 season. In that time, the Bearcats have gone 47-137, including just 20-75 against AE opponents. The Bearcats lost by 32 points when they faced the Hawks (18-11, 11-4 AE) in mid-January. This year will be the first time since 2012 that there are nine teams eligible for the conference playoffs. A committee of the conference’s coaches voted unanimously last year to forgo a play-in game in favor of eliminating the ninth seed. When asked if there was any single moment this season Binghamton could focus on moving forward, Dempsey said the team isn’t as far away from success as its record shows. He walked into the postgame press conference and blamed himself for this season’s lows. “The thing I’m most proud of is that we went through the struggle and really stayed with it,” Dempsey said. “We played hard every night and we’ve shown some signs of a team that I still feel like could be a really good team. The Bearcats have struggled to find any kind of rhythm all season long. And against the Hawks, a torrent of fouls and unforced turnovers hammered the final nail into the coffin of any remaining playoff hopes BU held just three days after a dispiriting 21-point loss to Vermont. Saturday’s game was supposed to offer BU some sort of amnesty from a harsh stretch of what has been an unexpectedly tough season. It was senior day, during which the program honored all seven of the graduating players. Dempsey decided to start all five healthy seniors. So in the first half, the Bearcats played a jittery, almost emotional form of basketball. They kept Hartford to 1-10 from 3-point range, where they entered the game averaging 34.9 percent. Sophomore guard Fard Muhammad scored nine points in the first half, going three-for-four from beyond the arc. But BU also coughed the ball up seven times in the first half while only forcing one turnover. The team ended the game with 11 turnovers and 17 personal fouls that allowed Hartford to go 18-of-23 from the foul line. Binghamton made it to the line just four times in the entire game. A dunk by junior forward Thomas Bruce with a little over nine minutes left in the game seemed to energize Binghamton’s bench. A free throw immediately after gave the Bearcats a one-point lead. Hartford, though, continued to find success driving to the basket. A layup from Hartford junior guard Travis Weatherington put the Hawks back in the lead and sparked a 7-0 stretch that put the game out of reach for BU. Muhammad led Binghamton with 14 points and three assists. He was followed by junior guard J.C. Show, who contributed 13 points. Bruce put up a near double-double with nine points and 13 rebounds. Redshirt junior forward John Carroll led Hartford with 23 points and 15 rebounds. He shot nine-for-11 from the free-point line. The Bearcats are set to finish their season against Albany on Tuesday. Tipoff is scheduled for 7 p.m. from SEFCU Arena in Albany, New York.